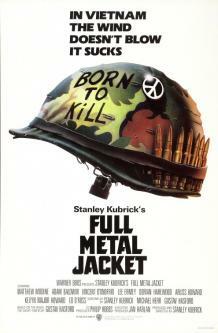 “Stanley Kubrick's Full Metal Jacket establishes its grip on the viewer's attention instantaneously, with an opening scene in which young recruits are shorn by an off-screen Marine Corps barber, while a corny, lulling song is heard in the background. The scene would be ordinary, even a cliche, were it not for the look on the young men's faces. In their eyes we see absolutely nothing: no apprehension, no bravado, not even blind obedience, only the emptiness of clay ready to be molded. “The sense of sheer animal helplessness, conveyed with the seeping white light, uncluttered frames and daunting angles of which Kubrick is a master, is a shock. It's also a challenge to the audience to remain mindful of these men's humanity, despite the brutal and dehumanizing ordeal to which they will be subjected.